Textiles on the Edge... (of the Planet): My new studio! 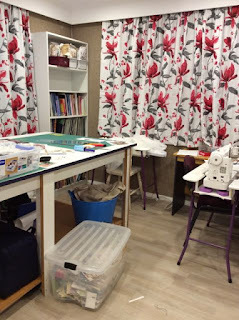 I have a new sewing room/studio in my house. Its really nice to have the extra space as a lot of my 'stuff' has been left stored in the little room I had previously. Hopefully both sons won't want to come home to live at the same time as we now only have one spare room. Anyway, to celebrate the new room I have started teaching private beginners patchwork, collage/ appliqué and machine quilting classes. I also hope to run some very small classes during the week and some play days for small groups who want to try out different techniques. I'm also happy for people to do 'studio visits' (just ring first) or can arrange a short private class for overseas visitors who want to make a memento of New Zealand. Just get in touch to let me know what you would like. 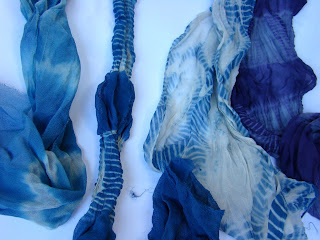 The first small group play day is Indigo dyeing and shibori. Email me at smith_c*actrix.co.nz for further details or reply to this post. Note to Chyfly who commented on my previous blog post, I'm sorry I don't seem to be able to answer your comment so I left a message in the previous post! Thanks for letting me know about the tatters in relation to the barge-man's clothes, that was very interesting and I'd love to know more but couldn't find anything on Google. Would love to do an indigo class, it's one kind of dyeing I've never done. When are you coming up this end of the country? !